According to the Russian defense chief, the number of aircraft increased from eleven to 101"
MOSCOW, July 24. /TASS/. The number of aircraft involved in NATO drills in Eastern Europe has increased almost ten-fold, from eleven to 101, over the past five year, Russian Defense Minister Sergei Shoigu said on Tuesday. "NATO continues to build up contingents of its off-region countries in Eastern Europe. Since 2014, their strength has increased from 2,000 to 15,000 servicemen," he said. "More than 100 drills involving up to 80,000 troops have been held since the beginning of the year. Over the past five years, the number of servicemen annually engaged in exercises has increased ten-fold, and the number of aircraft increased from eleven to 101." Apart from that, "five cyber operations centers have been deployed in Europe with the help of the United States, namely in Finland, Estonia, Poland, Germany and France," he noted. 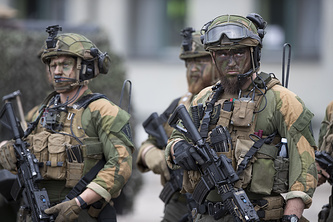 "Of serious concern is the fact that Finland and Sweden are being dragged into NATO structures. An agreement was signed in May providing for their full-fledged participation in NATO drills and for possible use of its troops and weapons control systems. In exchange, NATO has been granted unimpeded access to the airspace and territorial waters of these countries," Shoigu said. "Such steps by the Western colleagues are fraught to the collapse of the existing global security system, breed mistrust and force us to take response measures," the minister stressed.